That says 2 pounds of ground beef — not 2 tablespoons! 1) Brown the onion and apple in the butter, let cool. 2) Mix the ground beef, incorporating the spices, sugar, raisins, soaked bread (schmoosed) and eggs. 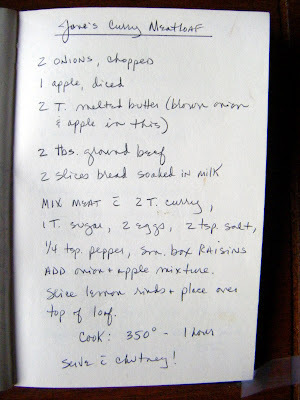 3) Add the onions/apple to the beef/spice mixture. 4) Spoon into a loaf pan. 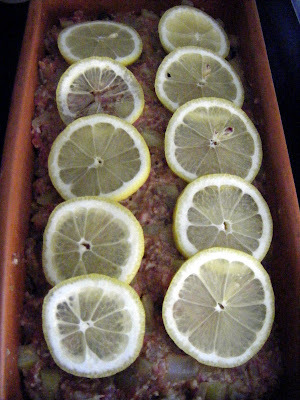 5) Garnish with lemon slices (you may omit this decorative step). 6) Bake for one hour.